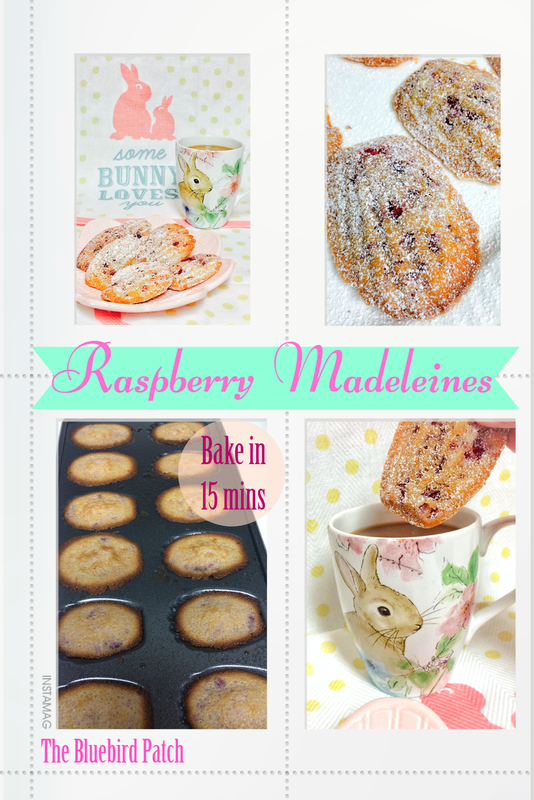 Madeleines are a sweet buttery french pastry or “tea-cookie” that pairs spectacularly with your “cafecito” (coffee). These precious tender little cake-like cookies are baked until golden crisp, in special molds, that give them a delicate shell shape. They are thick in size, but light, soft, and smooth in texture similar to a sponge cake, and are loaded with a rich decadent buttery flavor. Madeleines are easy to make, and once you get the hang of it, you will be obsessed making them for parties or giving them away as gifts. 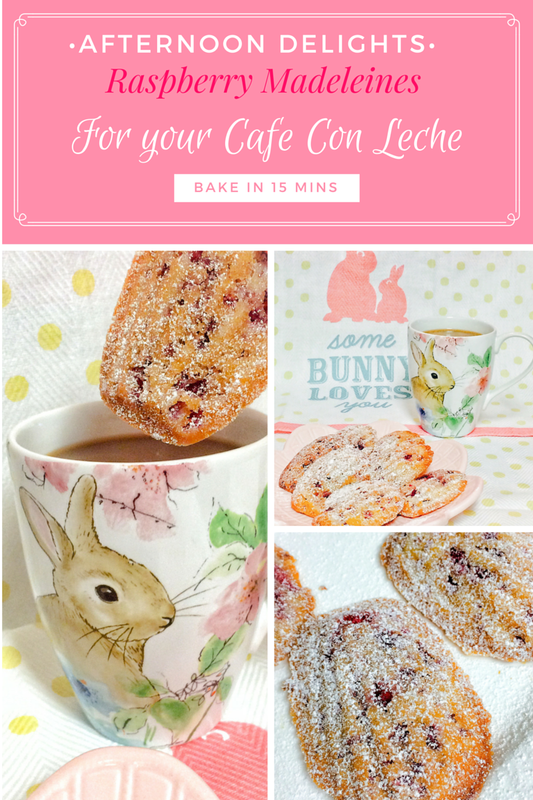 They literally take 15 minutes to bake! Whip your room temperature eggs and the sugar on your mixer for about 5 minutes until it gets thick and frothy and the batter changes to a white color. Meanwhile, melt the butter in a 1½-quart thick-bottomed saucepan, bring to a boil, and brown lightly. Place the 2 Tbs. flour in a bowl and blend in 3 Tbs. of the butter, then set aside. Stir the remaining butter over an ice-water bath until cool but still liquid, then blend in the remaining eggs into the batter along with the salt, lemon zest, juice and vanilla. 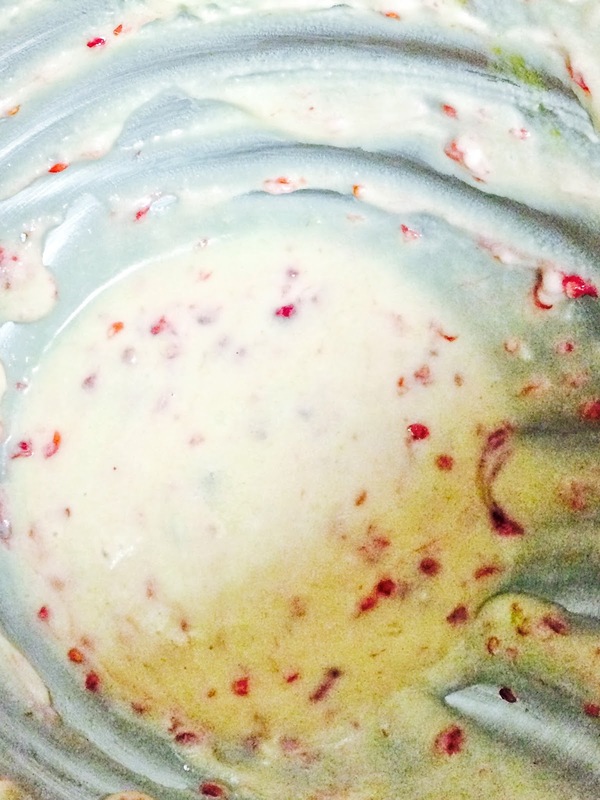 Stir in 2 tablespoons of the flour with the lightly mashed raspberries and add to the batter. Freeze the prepared molds before baking and chilling the batter for at least 3 hours in advance. This ladies and gentleman is the secret of a perfect madeleine. Omit this step and they will come out tasty but not spectacular! Preheat oven to 375°F, with racks in the upper and lower middle levels. Using a pastry brush, paint the madeleine molds with the reserved butter-flour mixture. Divide into 36 lumps of a generous tablespoon each, and drop into madeleine cups. Bake the madeleines for 13 - 15 minutes (7-10 minutes for smaller cookies), or until the edges of the madeleines are golden brown. Remove from oven and unmold immediately. When cool, turn shell side up and dust with confectioners’ sugar. They will keep refrigerated for a day or two in an airtight container or longer in the freezer. Now food is key for a perfect afternoon delight but so is the ambiance. This is why I love Glade® products. They are all about evoking emotions. When you use a Glade product, you don’t just smell Glade®, you feel Glade®. 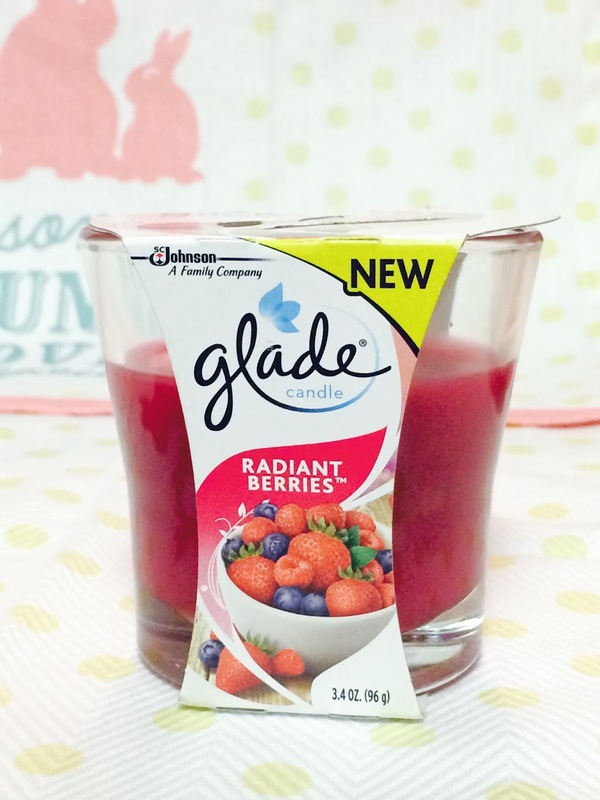 I love using the Glade® Radiant Berries™ scented candle at home because it has notes of raspberry and yumberry which put me in a positive frame of mind that keeps me looking on the even brighter side. I like to live my life bright and bold and Glade® Radiant Berries™ scented candle’s hints of watermelon and grapefruit prevents anything from even coming close to raining on my parade. Glade® is all about feeling in the moment.